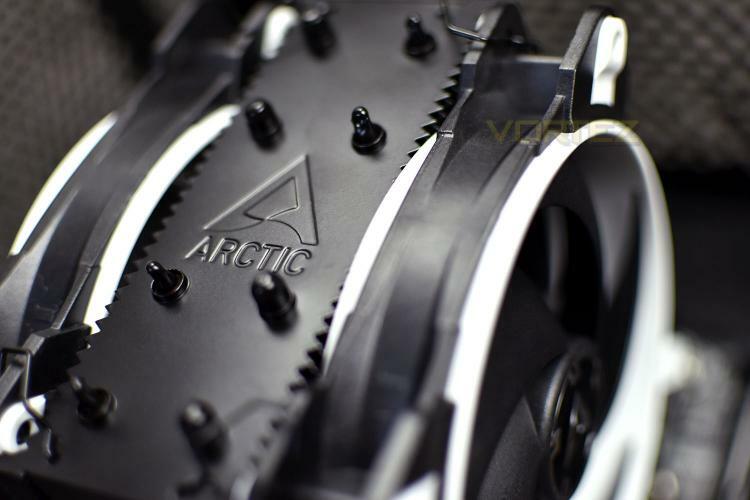 Arctic, within the enthusiast market, are a well-known brand. PC Builders have been using their kit for years, with their thermal paste being arguably one of the most popular of all time. Today we look at the latest air-cooling tower from them, the Freezer 34 eSports DUO. The cooler is available in four different colours, red, yellow, green and the one we’ll be looking at today, white. All four models share the same price tag, at £34.99 in the UK and $39.99 in the US, for that you receive two fans which RRP for £13.99 each along with an industry leading 10-year warranty. The 34 eSports DUO gets its name, at least in part, for the pair of fans strapped to the heatsink in a push-pull configuration. We’ve actually reviewed the Arctic BioniX P120 fans separately and were rather impressed by their performance, so to then bolt these to their Freezer 34 cooler should present some decent performance. We reviewed the Freezer 33 eSports, featuring the same dual fan layout, back in 2017, so we’ll get straight to it and see how it performs compared to the previous generation. With two powerful, pressure-optimised BioniX P-fans and its updated, thermal-coated heatsink, the Freezer 34 eSports DUO offers a lot of performance for a fair price. In internal tests levelled to 28 dB(A), the Freezer 34 eSports DUO was able to surpass many competitors, even much bigger and more expensive double tower cooling solutions. More information about our performance test and the max.